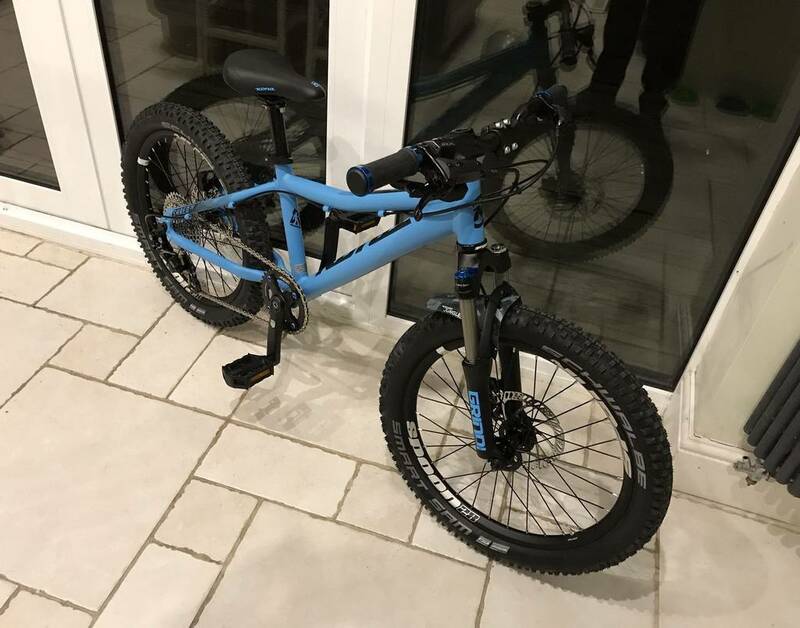 ​My 6 year old son is getting to the point where he needs a decent bike for riding the trails at our local centre. We are lucky to live within riding distance from a park with a good set of trails, so he is loving the berms, jumps and particularly the blue trail descents. He's been riding a Cannondale Quick 20. This is a hybrid, which with the addition of slightly fatter tyres and a rapid fire shifter becomes a very capable little bike. It's extremely well made, and importantly the gearing is sensible. ​It has a 30T chainring on the front and a sunrace 11-28T on the back. He finds this range perfect for riding up and down our trails. So to summarise the Quick - it's a great little bike for most kids and has been brilliant, it's just a bit hard to handle once the going gets rougher. He's also seen other kids with suspension on the front end (most of them poor quality and cheap). I've always been sceptical of suspension for kids, favouring a fatter tyre, however even with 20" x 1.95 Schwalbe Black Jacks on his bike, you can see that even the small rocks and roots really affect his lines. I looked into adding a suspension fork to the Cannondale, but alas they chose to put a 1" steerer on that bike and you can't get a decent set of suspension forks without going to 1 1/8". There seem to be more and more 20" bikes coming out all the time, and a few have caught my eye. My criteria has been - 1) Nice fat tyres, 2) An AIR shock, 3) Sensible Gearing and Cranks, 4) Sensible Weight. 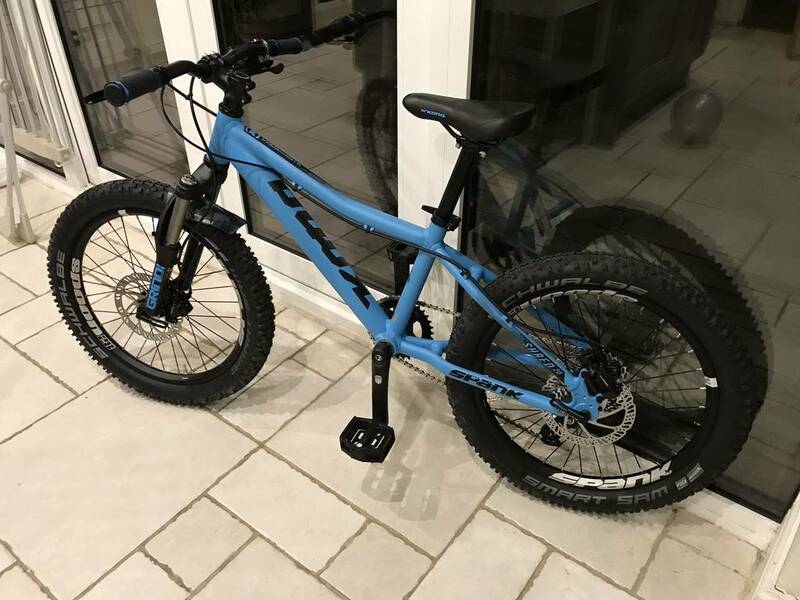 Commencal Meta 20 - Amazing bike - expensive! Spawn Cycles Yama Jama 20 - Even more expensive! So, having consumed too much beer for rational thought, I bought one immediately. 2) The forks - Spinner Grind Air 20 - one of the best and fully tune-able to get it working even with a very light child. 3) Brakes - Tektro hydraulic with 160mm rotors - the reach of the lever is adjustable too. 2) The shifter - A crappy revoshift twist shifter. These are put on kids bikes because they are 'easy' for them to get their head around... But they are much stiffer than rapid fire shifters and my son just didn't get on with them. Anyhow - if 6 year olds are able to operate Netflix - they can certainly get their heads around a rapid fire shifter! 3) The gears - 6 speed 14-28 shimano freewheel with a 36t chainring. This is meant to be a mountain bike - there is no way this is going to work after coming from the 30t - 28t arrangement of the Cannondale - and 14t high gear - even with 36t up front would mean he's not able to spin out as fast as the Cannondale despite the bigger chainring... This was a really poor choice Kona and doesn't look great either! These items together ruin the bike for proper trail riding which is a massive shame... However I like the look of the bike and surely it can't cost that much to do a few small upgrades? ​Since I'd got the bike now, I decided to change as much as I could to sort it out. One thing leads to another as they say, so I ended up changing a little more than I'd anticipated. I figured that I might be able to do this all and still stay under the £200 that I'd saved off the list price of the bike in the first place - I just needed to make sure that I didn't get carried away! I removed the rear wheel and inspected it to see what cassette I could fit on there, I hit my first problem... The cassette looks very different to my bike. A quick google, and it turns out there are bikes with freehubs + cassettes (like mine) and bikes with freewheels that screw onto the hub (these tend to be cheaper / older bikes). I resigned myself to getting the freewheel that's on the Kona Honzo which has 13-34t Shimano & 7 speeds - a definite improvement, but still not the range of his old bike with the 36t front spocket. 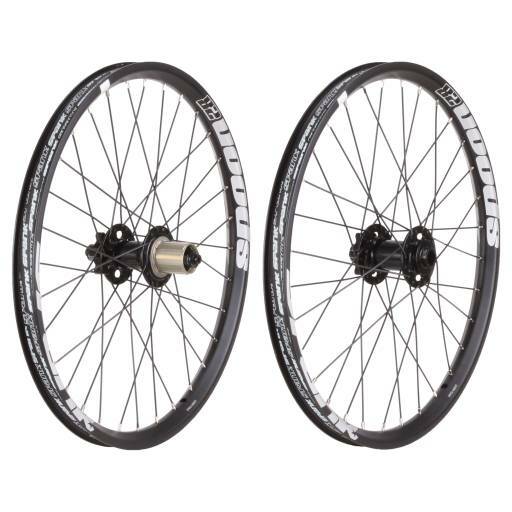 A £300 set of 20" wheels by Spank... With over 40% off at Wiggle! Total cost £170... This would solve my freehub issue, by allowing me to fit a cassette with either 9, 10 or 11 speeds, and of course make this build so much cooler but it would push the cost way over my budget... (most parents don't spend £170 on the whole bike!). Once they arrived, the thing that hit me what just how much lighter they were than the ones that came off - massively lighter! I guess the original hubs were cheap and the rims were actually cheap rim brake rims - which tend to be heavier than the ones made for wheels with disk brakes. The thing about kids bikes is that the tyres to make quite a difference to the ride... Kids are only light, so small rocks can bounce the whole bike around - especially if the tyres are skinny and the pressure is high. On the road high pressure is ok, but as soon as they venture off road, we need a very different approach. The first thing any Bike Dad needs to do is make sure the pressure is much lower than you'd have in your own tyre - if you are going off road, let loads of air out so you can push your thumb into the tyre fairly easily. Sit your child on the bike and see how much pressure you need so that there is a little give when they are riding - you'll find the pressure is way lower than you might have expected. Adding the 1.95" tyre to the Cannondale helped from the original hybrid tyres, but still could be better. 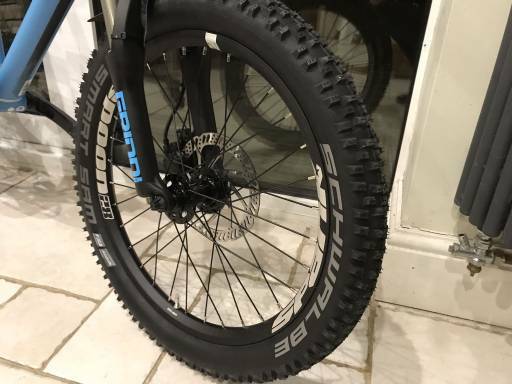 There are a couple of options now for fatter 20" tyres, but you need to do some hunting around... Luckily the Kona has a generous amount of room, so I was able to plump for a pair of Shwalbe Smart Sam 20 x 2.35" at £10 per tyre. These not only look the business, but also have a nicely spaced tread pattern. The added bonus is that it is theoretically possible to run these tubeless which would make them even lighter - I've not done it yet, but watch this space...! In the end I found some 135mm cranks from Kidsracing.co.uk these guys were helpful and sent them through straight away. 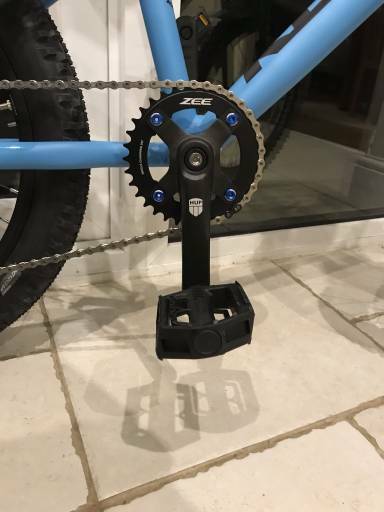 The cranks seem really good quality and have a matt black finish. They take 104 BCD chain rings. I still think these are slightly too long - the rule of thumb is around 10% of the child's height - my son is around 125cm tall, so ideally they could be 10mm shorter. There is a lot of info online about crank length, but away from the internet of opinions, I see other kids with long cranks really struggle up hills that my son is spinning up easily - you can see their legs are way too high at the top of the stroke, and since the power output is at its greatest at 12 o'clock on the stroke, this is really important. For the chainring itself, I've gone for a Shimano Zee 34t - mainly because it was cheaper than a Raceface or Hope equivalent. I found some blue chainring bolts on eBay which finish it off nicely. This will give him a greater range at both ends than his current set up. The jury is out for me on whether 34 or 32 would be better, but we can only wait and see. I contacted an Irish bike shop owner who had created a dream build Shred for his daughter using very exotic Hope components. I asked his advice on derailleurs and gearing. 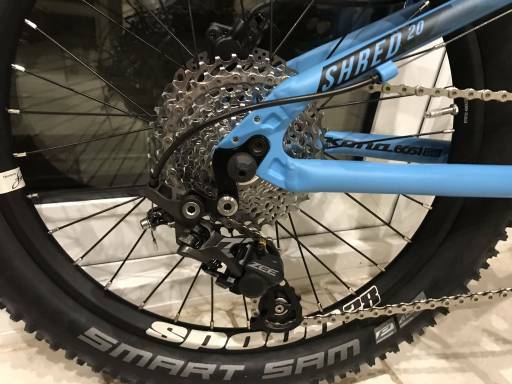 He used a Shimano Zee, which is a downhill short cage derailleur, but it's 10 speed and, in Freeride form, is capable of handling a 11-36t cassette, so I went for one of those, married up to a Shimano SLX 10 Speed shifter. It looks good with the short cage, it shifts really well too. The cassette came off my bike when I upgraded to 11 speed, its a 11-36 SRAM and I bought a SRAM 10 speed chain to go with it. I'm super pleased with the end result - it's a lot lighter (mainly due to the wheels) and the gearing is much better. The wheels really make the difference, but it ended up quite expensive. But it's a custom original and very cool. I've got immense pleasure out of doing it, and would do it again in a flash. 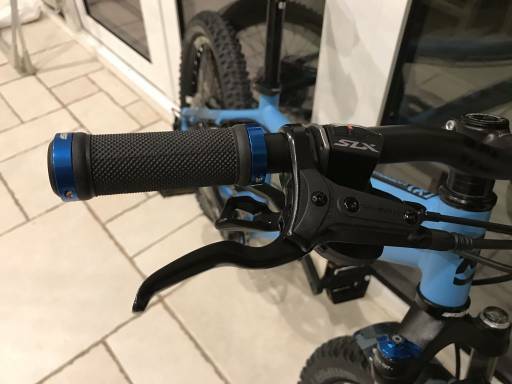 In the end I spent slightly less than buying a stock Commencal Meta HT 20, but more than an Early Rider 20 HT, so if you just want a great kids trail bike, and don't want this hassle then you can just fork out for a stock bike quite easily.